FILE - U.S. and Iowa state flags are seen next to a cornfield in Grand Mound, Iowa, Aug. 16, 2015. A U.S. federal court has sentenced a Chinese national to three years in prison for agricultural espionage — stealing extremely valuable corn seed and sending it to China for analysis. Mo Hailong admitted his crime in a plea agreement earlier this year that enabled him to avoid a trial. The court ordered Mo to pay restitution to his victims and surrender two farms he bought as part of the conspiracy, which began in 2011. Several other Chinese suspects are believed to have fled the U.S. before they could be charged. FILE - A DuPont logo is pictured on the research center in Meyrin near Geneva. The plot was uncovered when a security guard found Mo digging in a cornfield in the middle of Iowa, as another Chinese national waited nearby in a getaway car. 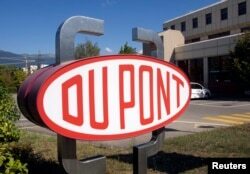 The field was under guard by a subsidiary of the DuPont Corporation because it was used to grow several of the firm's "most highly anticipated inbred corn seed products," not yet commercially available. Mo and his companion pretended they were researchers and fled before they could be detained. However, the situation eventually came to the attention of the FBI, which uncovered another incident where Mo and other Asian men were stopped at another farm for "acting suspiciously." The men said they were visiting from China and driving across the U.S. farm belt "looking at crops" — in this case, another field of "inbred corn seed," a genetically modified product that could be worth millions of dollars. Mo, who is 46, had permanent resident status in the United States, where he worked for a Chinese technological conglomerate, DBN, that operates a corn-seed business. "Theft of trade secrets is a serious federal crime as it harms victim companies that have invested millions of dollars and years of work toward the development of propriety technology," U.S. Attorney Kevin VanderSchel said this week before the sentence was announced. "The theft of agricultural trade secrets and other intellectual property poses a grave threat to our national economic security." Mo's lawyer said his client is sorry for his crimes, and that his chief concerns are his family and his health, following a cancer diagnosis last year. 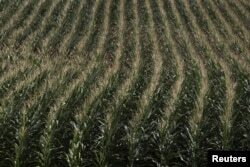 FILE - A cornfield is seen in DeWitt, Iowa, July 12, 2012. The FBI put Mo and his accomplices under surveillance beginning in early 2012, watching as they purchased large quantities of new seed products from multiple companies. Authorities learned that a small number of valuable "pure inbred" corn seeds could be isolated from the large quantities of hybrid seed the Chinese team acquired. Federal agents bugged a rented car used by two of the Chinese corn thieves and recorded a conversation in which they discussed their activities and the possible consequences they could face. "They could treat us as spies!" one of the men exclaimed, according to the criminal complaint filed last January. "That is what we've been doing," his companion responded, speculating that they could face multiple criminal charges. Soon after that September 2012 conversation, when some of Mo's co-conspirators attempted to fly back to China, U.S. authorities broke open what appeared to be two factory-sealed bulk cartons of microwave popcorn in their luggage. Beneath a top layer of popcorn were 100 small envelopes holding corn seeds. Another traveler had corn seeds wrapped in paper napkins hidden in his packed clothes. A criminal complaint was filed against Mo in December 2013, and the case has been making its way through federal courts in Iowa since then. The other men involved in his admitted plot were released from detention some time ago, but are now being sought by the Federal Bureau of Investigation to face conspiracy charges.